We must not forget! In June 2006 a soldier of Tank regiment 71 abducted by Hamas during a recon in the Gaza strip- that soldiers name is Gilad Shalit. Today, more than 4 years later, Gilad is still being held captive. He is granted none of the rights war prisoners legally deserve, allowed no visits from the Red Cross and no communication with the outer world. 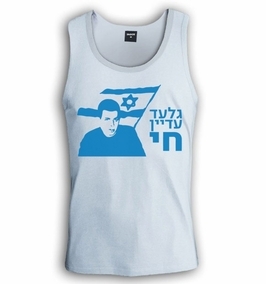 This iconic T- shirt sporting the picture of Gilad, the Israeli flag and the caption "Gilad is still alive" was made in support of the struggle to see Gilad back in his homeland Israel. Wear this shirt so that the fight for Gilad's return will not be forgotten and abandoned Gilad is still alive, and we will not rest till he is once more safely and soundly in his home! Our t-shirts are made of 100% cotton and are long lasting with bright colors. Our products are all designed and printed in Israel.